Best Management Practice (BMP) – From MDNR’s 10 CSR20-6.200: Schedules of activities, prohibitions of practices, maintenance procedures, and other management practices to prevent or reduce the pollution of waters of the state. BMPs also include treatment requirements, operating procedures and practices to control plant site runoff, spillage or leaks, sludge or waste disposal, or drainage from raw material storage. Boundary Point Source – a point source that is not an outfall. 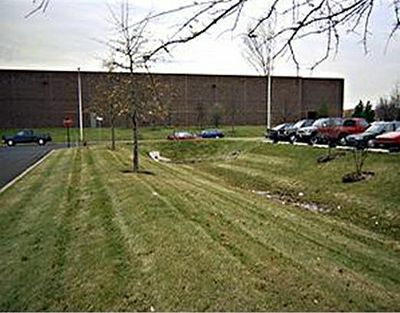 The location where the point source leaves MoDOT right of way. Illegal connection - a pipe or other conveyance that has illegally been connected to MoDOT’s MS4. Illicit discharge - is defined by MDNR's 10 CSR 20-6.200 as a discharge of pollutants to a Municipal Separate Storm Sewer System (MS4) that is not comprised entirely of storm water and is not authorized under the NPDES permit. Major stormwater outfall – MDNR defines as “a municipal separate storm sewer outfall that discharges from a single pipe with an inside diameter of thirty-six inches (36") or more (or its equivalent)”. Reference: 10 CSR 20-6. MoDOT Community – MoDOT staff and external partners including contractor’s and consultants. MoDOT’s MS4 area – MDNR designated MS4/urban areas, outstanding state and national waters, Total Maximum Daily Load (TMDL) effective watersheds. MS4 – Municipal Separate Storm Sewer System. E. Sewers that are defined as large or medium or small municipal separate storm sewer systems pursuant to paragraphs 10., 15., and 28. of this section, or designated under subsection (1)(B) of this rule. New development – MoDOT defines new development for purposes of the MS4 permit, to mean projects (with land disturbance greater than or equal to 1 acre) that are constructed where there was previously no transportation facility. Nonpoint source – a type of pollution that occurs when water runs over land or through the ground, picks up pollutants, and deposits them in surface waters or introduces them into groundwater. Non-structural practices/controls - operational BMPs that prevent or reduce pollutants from entering storm water. Examples include preventative maintenance procedures, minimizing impervious surfaces, and spill prevention and cleanup. Permanent BMP – a best management practice designed to be permanently left in place after construction to treat or contain stormwater. Point Source – any discernible, confined and discrete conveyance, including but not limited to any pipe, ditch, channel, tunnel, conduit, well, discrete fissure, container, rolling stock, concentrated animal feeding operation, or vessel or other floating craft, from which pollutants are or may be discharged. Point source does not include agricultural storm water discharges and return flows from irrigated agriculture. Pollutant - Dredged spoil, solid waste, incinerator residue, sewage, garbage, sewer sludge, munitions, chemical waste, biological materials, radioactive materials, heat, wrecked or discarded equipment, rock, sand, cellar dirt, filter backwash or industrial,municipal or agricultural waste discharged into water. Reference: Reference: 10 CSR 20-2. Redevelopment - MoDOT defines redevelopment for purposes of the MS4 permit with respect to transportation facilities, to mean non-maintenance work performed to or on an existing public transportation facility which provides for an increased number of thru lanes of travel unless the work can be accommodated without increasing the width of the existing pavement. Widening of an existing road that does not result in an additional thru lane does not constitute redevelopment. Widening to add shoulders does not constitute a thru lane unless the total widening is greater than or equal to 10 feet. Run-on – storm water from adjacent landowners or development that is combined with MoDOT’s storm water. Storm water outfall – a point source where intentionally collected storm water exits the right of way (ROW) and enters a “water of the state”. For example, roadside ditch. (Stormwater) Outfall – MoDOT defines an outfall as intentionally collected stormwater that is “A point source as defined by 10 CSR 20-2.010 at the point where a municipal separate storm sewer discharges and does not include open conveyances connecting two (2) municipal separate storm sewers, pipes, tunnels, or other conveyances which connect segments of waters of the state and are used to convey waters of the state.” Reference: 10 CSR 20-6. 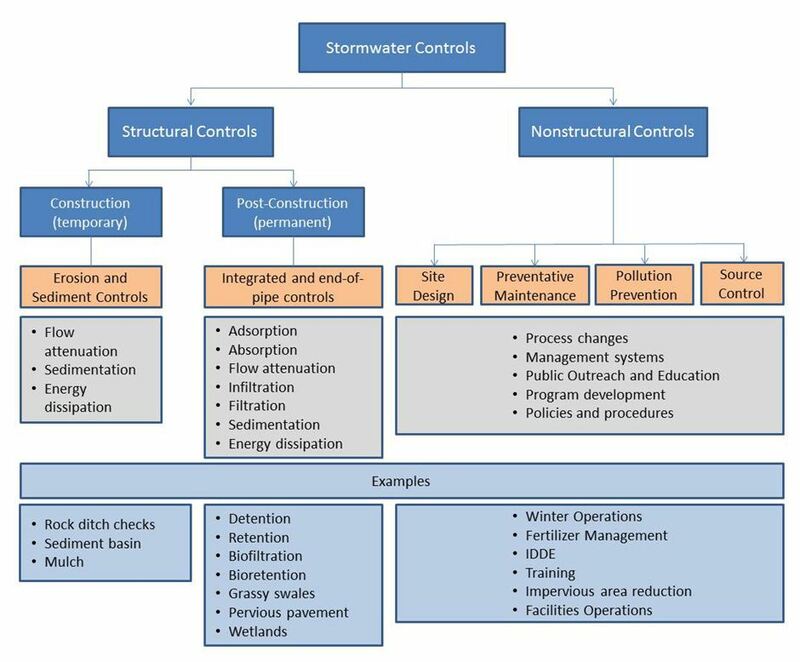 Structural practices/controls - physical, structural or mechanical devices or facilities intended to prevent pollutants from entering storm water. Examples include building berms around potential pollutant source areas, roofs over outside truck wash bays, etc. TMDL Total Maximum Daily Load - a mathematical calculation of the amount of a specific pollutant a waterbody can absorb and still meet water quality standards. waters of the state – MDNR defines as “all rivers, streams, lakes and other bodies of surface and subsurface water lying within or forming a part of the boundaries of the state which are not entirely confined and located completely upon lands owned, leased or otherwise controlled by a single person or by two or more persons jointly or as tenants in common and includes waters of the United States lying within the state.” Reference: Missouri Revised Statutes 644.016. Offer guidance in the consideration of physical, operational, and cost (capital and maintenance) characteristics of post-construction best management practices (BMPs) for water quality. Provisions of the Federal Clean Water Act and related state rules and regulations require a municipal separate storm sewer system (MS4) permit when the facility serves a population of 1,000 or more within an urbanized area or are located outside an urbanized area serving a jurisdiction with a population of at least 10,000 and a population density of 1,000 people per square mile or more. Furthermore, a municipal separate storm sewer means a conveyance or system of conveyances including roads and highways with drainage systems, municipal streets, catch basins, curbs, gutters, ditches, paved or unpaved channels, or storm drains designated and utilized for routing of storm water. MoDOT has an MS4 general permit, obtained from the Missouri Department of Natural Resources (MDNR), delegated by the Environmental Protection Agency (EPA). It requires MoDOT to develop and adhere to a Storm Water Management Plan (SWMP) comprised of six minimum control measures (MCMs) listed below. Permit requirement. The permittee shall implement a MoDOT community education program to distribute educational material to the community or conduct equivalent outreach activities about the impact of stormwater discharges on waterbodies and steps that MoDOT community can take to reduce pollutants in stormwater runoff. MoDOT shall establish BMPs under this program focused on the general public. 2. A plan to target potentially affected stakeholder groups with the purpose of allowing the opportunity to provide various viewpoints concerning appropriate stormwater management policies and BMPs. 5. A plan to provide opportunities for citizen volunteers to assist in conducting right-a-way clean-up activities. The Public Notice (PN) for SWMP and renewal application will be a minimum of 10 days and will be posted on MoDOT’s Stormwater webpage in addition to being emailed statewide with an opportunity for public hearing (see EPG 129.13 Public Involvement for Stormwater). This specifically applies to the SWMP and renewal application which is submitted to MDNR every 5 years upon permit expiration. MoDOT’s policy regarding illegal connections and discharges into MoDOT’s system is described at EPG 127.25.8.3.2 System Attachments by Others and EPG 127.25.8.3.1 Industrial and Domestic Waste Waters on Right of Way. Notification of appropriate local or state agencies of illegal dumping or illicit discharges, as soon as practicably possible, is an acceptable enforcement procedure or action. 3. A plan and schedule to detect and address non-stormwater discharges, including discharges from illegal dumping and spills, to the TS4; Private homeowners are regulated by the Missouri Department of Health and Senior Services. The Missouri Department of Health and Senior Services is to be contacted when wastewater discharge from a private homeowner is found on the right of way. Commercial businesses and industries are regulated by MDNR. When wastewater discharge from a regulated entity is discovered on MoDOT right of way, the Environmental Specialist will contact MDNR to determine if the commercial business or industry has a valid operating permit issued by MDNR to discharge effluent. 5. The permittee shall address the categories of non-stormwater discharges or flows listed under Part A – COVERAGE AND RESTRICTIONS, item 2 (a – q) if the permittee identifies them as significant contributors of pollutants to the TS4. Vehicular accidents are not considered illicit discharges unless the spill enters waters of the state. For additional information see EPG 127.25.3.1 Rest Area Lagoon, EPG 127.25.8.3 Sewage Disposal System, and EPG 127.25.8.3.2 System Attachments by Others. Sources of illicit discharges are spills from roadway accidents, sanitary wastewater, effluent from septic tanks, improper oil disposal, laundry wastewaters, improper disposal of auto and household toxics, etc. See EPG 127.25.8.3.1 Industrial and Domestic Waste Waters on Right of Way and EPG 127.25.8.3.2 System Attachments by Others. This measure covers our existing policy in EPG 806 Pollution, Erosion and Sediment Control Program. Additionally, this measure is also covered within EPG 173 Erosion Control for Maintenance Operations. The permittee shall develop, implement, and enforce a program to reduce pollutants in any stormwater runoff to their TS4 from construction activities on areas owned by MoDOT that result in a land disturbance of greater than or equal to one acre. Reduction of stormwater discharges from construction activities disturbing less than one acre must be included in the program if that construction activity is part of a larger common plan of development or sale that would disturb one acre or more. If the NPDES permitting authority waives requirements for stormwater discharges associated with small construction activities on areas owned by MoDOT in accordance with 40 CFR 122.26(b)(15)(i), then permittee is not required to develop, implement, or enforce a program to reduce pollutants discharges from such sites. 5. Procedures for site-inspections and enforcement of control measures. 3. Policies or procedures to ensure adequate long-term operating and maintenance of the BMPs. Non-structural practices/controls are BMPs that are planning procedures or site-specific BMPs such as riparian zone preservation, minimization of disturbance and imperviousness, and maximization of open space. Structural BMPs fall into three categories (EPA Fact Sheet) or three main types of treatment BMPs. These three types are not mutually exclusive, but one BMP may fit into more than one type. Retention/Detention BMPs: These types of BMPs gather runoff and hold it while slowly releasing it into drainage systems or receiving waters. These can be designed to control storm water volume and settle out particulates. 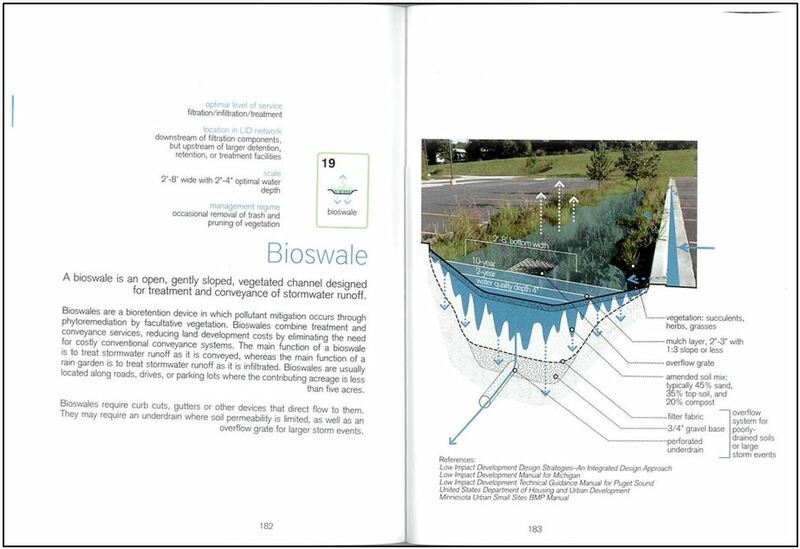 Examples include: dry detention basins, wet detention basins, biodetention, stormwater wetland, wet ponds, etc. Photo of dry detention basin designed to temporarily detain runoff during storm events. Infiltration BMPs: These types of BMPs encourage filtration through soil to groundwater which results in reduced storm water runoff quantity and therefore pollutants. Examples include infiltration trenches/ditches/basins, grassy swales, pervious pavement, and infiltration basins or trenches. Vegetative BMPs: These types of BMPs are landscape features that remove pollutants and facilitate percolation of runoff by maintaining natural site hydrology. 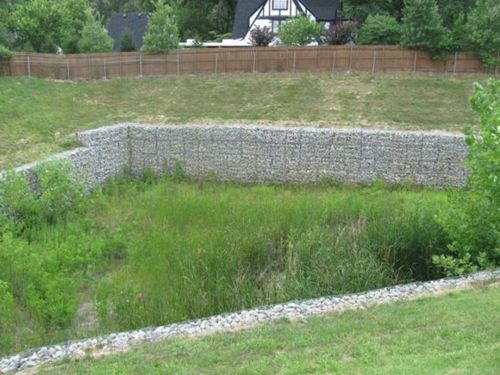 Examples include grassy swales, filter strips, rain gardens, and wetlands. Filtration Basin A shallow basin with engineered media or soil and an underdrain. Filtration, sorption, biological uptake, microbially mediated transportations. 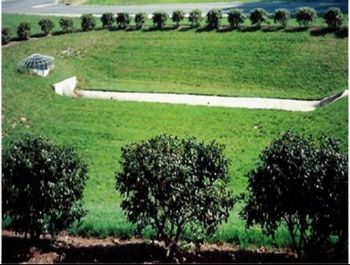 Bioretention Basin A type of filtration basin with engineered media, an underdrain and landscaped vegetation. Filtration, sorption, biological uptake, microbially mediated transportations. Dry Detention Basin A dry basin that temporarily holds water and slowly releases it over time. Detention, sedimentation, sorption. Filter Strip A linear section of land, either grassed or forested that physically infiltrates storm water. Filtration, infiltration, sorption, microbially mediated transformation, biological uptake. Swale A broad and shallow U-shaped channel with dense vegetation. Filtration, infiltration, sedimentation, microbially mediated transformation, biological uptake. Infiltration Basin A shallow basin in permeable soils that detains and infiltrates storm water runoff. Infiltration, sorption. Level Spreader A trough and level lip used to redistribute concentrated storm water as diffuse flow and sometimes combined with a filter strip. Energy dissipation, infiltration. Wet Detention Basin A shallow basin that maintains a permanent pool of water using a control structure. Detention, sedimentation, biological uptake, microbially mediated transformations. Preformed Scour Hole A riprap lined basin formed at the outlet of a pipe. Energy dissipation, infiltration. Forebay A small basin located upstream of another storm water control. Detention, sedimentation. Storm Water Wetland Lands on which water is present either at or near the surface of the soil permanently or seasonally and supports wetland vegetation such as cattails. Detention, sedimentation, sorption, biological uptake, microbially mediated transformations. FHWA provides a good overview of BMPs and the expected treatment and maintenance of each. The projects will be reviewed using the request for environmental services (RES) process to screen projects for compliance with this requirement. The RES “Storm water/Water Quality” section should be addressed beginning at the initial/scoping phase for all projects that have greater than or equal to 1 acre of land disturbance and meeting the criteria of redevelopment or new development. See Fig. 127.29.7.2 Storm Water Post-Construction BMP Consideration. The storm water specialist will review RESs that meet these minimum requirements. Is the project within an MS4 area, TMDL watershed or cross an Outstanding State or National Resource water as identified in Tables D and E in CSR 20-7.031? (Refer to MS4 area map). Does the project disturb ≥ 1 acre? Does the project meet the definition of redevelopment or new development? If “yes” to all of these, then the project must consider permanent BMPs. MoDOT has defined redevelopment, for purposes of the MS4 permit with respect to transportation facilities, to mean non-maintenance work performed to or on an existing public transportation facility which provides for an increased number of thru lanes of travel unless the work can be accommodated without increasing the width of the existing pavement (with land disturbance greater than or equal to 1 acre). Widening of an existing road that does not result in an additional thru lane does not constitute redevelopment. Widening to add shoulders does not constitute a thru lane unless the total widening is greater than or equal to 10 feet. Examples include adding a through lane, widening a bridge by a lane width or widening shoulders that cumulatively add up to the addition of a lane width, etc. MoDOT has defined new development (new construction), for purposes of the MS4 permit, to mean projects (with land disturbance greater than or equal to 1 acre) that are constructed where there was previously no transportation facility. Examples include a new interchange on existing facility, adding an outer road where none existed previously, new facility where none existed previously, etc. MoDOT has defined maintenance, for purposes of the MS4 permit, to mean projects that do not meet the criteria of redevelopment or development. Examples include ramp widening or extending (less than a lane width), signal installation, intersection improvements, retrofitting an existing interchange (for example, typical to a DDI), slide repair, adding shoulders that is less than a lane width, guardrail replacement, resurfacing, and overlay projects. If a project meets the criteria listed above for development or redevelopment, permanent post construction BMPs must be considered that treat the new impervious runoff in redevelopment and mimic the pre-existing runoff condition in new development. The district designer shall work with the stormwater specialist to consider site constraints and opportunities. If part of a project is determined to be “new development” the entire project is captured under those requirements. General design philosophy will seek to mimic natural hydrology through dispersal and infiltration of runoff. The district designer shall determine new runoff storage for redevelopment and pre-existing runoff in new development. Treatment BMPs are engineered storm water treatment facilities and should be designated on all phases of plan sheets. Many of these measures will capture and hold water and potentially develop wetland characteristics over time. If these are designated as storm water treatment facilities, they will not be under the US Army Corps of Engineers jurisdiction as wetlands. Conversely, storm water BMPs should not be sited within an existing jurisdictional wetland or its natural vegetated buffer except by permit or as part of a wetland mitigation plan. 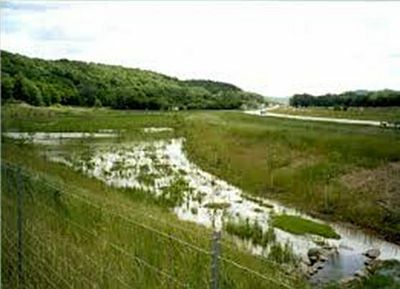 Wetlands may be considered for runoff treatment by passive means of dispersal. In areas where the drainage is not captured via curb and gutter, open-bottom, grassy ditches will serve as permanent BMPs. 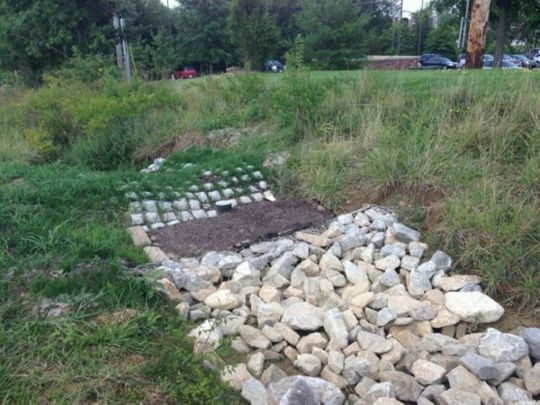 Grassy swales (i.e., ditches), while an important BMP, will not be tracked and inspected in MoDOT’s database of stormwater BMPs and therefore not inspected under that program. Grassy swales are defined as a flat-bottomed or U-shaped ditch. If a flat-bottomed or U-shaped ditch cannot be achieved due to other site constraints, ditch blocks/checks can be used in conjunction with V-shaped ditches to achieve infiltration and absorption goals. Additionally, grassy medians that capture drainage are also included as a post-construction BMP but not tracked and inspected. In project areas where a TMDL is in effect, it is feasible to tailor a permanent BMP to the pollutant identified. The American Association of State Highway Transportation Organization’s (AASHTO) Drainage Manual 2014 provides a table (Table 7-2) with the “Effectiveness and Applicability of Management Measures” for various permanent BMP control measures’ ability to remove specific pollutant types such as particulates, heavy metals, pesticides and organics. An example in table shows that curb elimination (promoting sheet flows) is highly effective at removing particulates, heavy metals and organics. There are currently 4 watersheds where MoDOT has been assigned a WLA. These are all in the St. Louis District. They are Coldwater Creek, Watkins Creek, Creve Coeur Creek and Fishpot Creek. When a new or redevelopment project is within any of these watersheds, MoDOT will first consider and give more value to media filters, bioretention and retention as BMPs. This shall be done in accordance with the MCM5 requirement to consider BMPs when a project disturbs ≥ 1 acre, is within the TS4 area, and meets the definition of redevelopment or new development. By the final RES stage submittal, the project shall include the location of the permanent BMP(s) on the plan sheets and noted under Water Quality/Stormwater section, for entry into the BMP database. Detention Basin at I-64 and McKnight in St. Louis, MO. FocalPoint filter in Columbia, MO. Projects where the only work involved is the addition or rehabilitation of paved surfaces not intended for use by motor vehicles (such as sidewalks or bicycle/pedestrian trails). Removing and replacing a concrete or asphalt roadway to base course, or subgrade or lower, without expanding the impervious surfaces. Permit projects where MoDOT is not building/letting and the project is not on MoDOT right of way (designed by MoDOT but let by others). During the scoping phase of the project delivery process, if a project is located within another MS4 regulated area, it is recommended the community be contacted by district staff or environmental staff to determine whether the community has post construction requirements under their permit program. Another option is to investigate the community’s website or other resource to determine if they have specific requirements. A general review of the MS4 community’s MCM 5 Post Construction Runoff Control requirements shall be conducted. The district shall use all pertinent BMP information to determine the preferred treatment BMPs or other BMP opportunities in the watershed. Since MoDOT is regulated by MDNR under a MS4 permit, MoDOT is not required to comply with another MS4 regulated community’s requirements. However, the district should make an effort to coordinate with the community in an effort to share responsibilities. If the MS4 community can provide a storm water treatment option off MoDOT right-of-way, it is most beneficial to pursue that opportunity. Working with MS4 communities to partner for long-term management and maintenance is preferred. 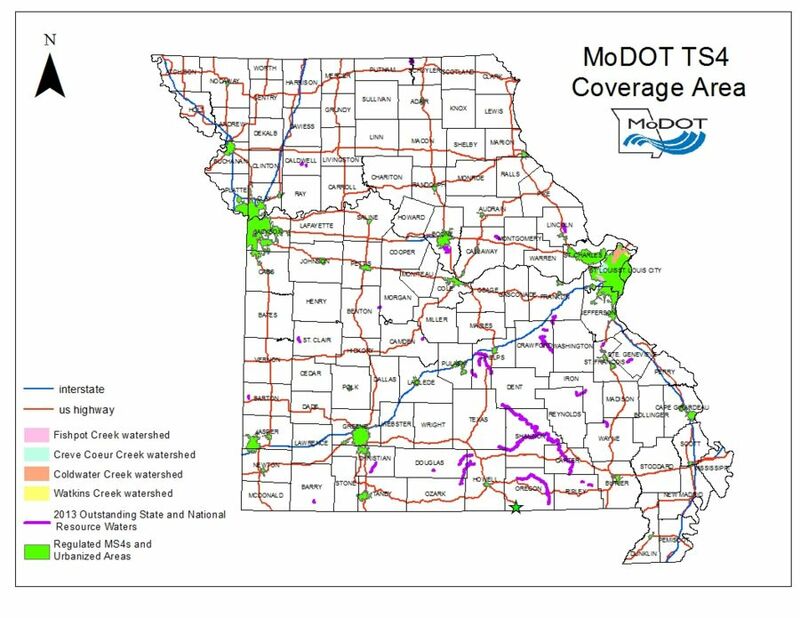 If a MoDOT project is partially within the MS4 coverage area, but partially outside of the MS4 coverage area, permanent BMPs shall only be considered within the MS4 coverage area. The entire project description shall be used to determine the type of project, redevelopment or development, and therefore type of treatment. If it is not feasible to include permanent BMPs in the project and there are opportunities within the portion of the project outside the MS4 area, a swap is acceptable. 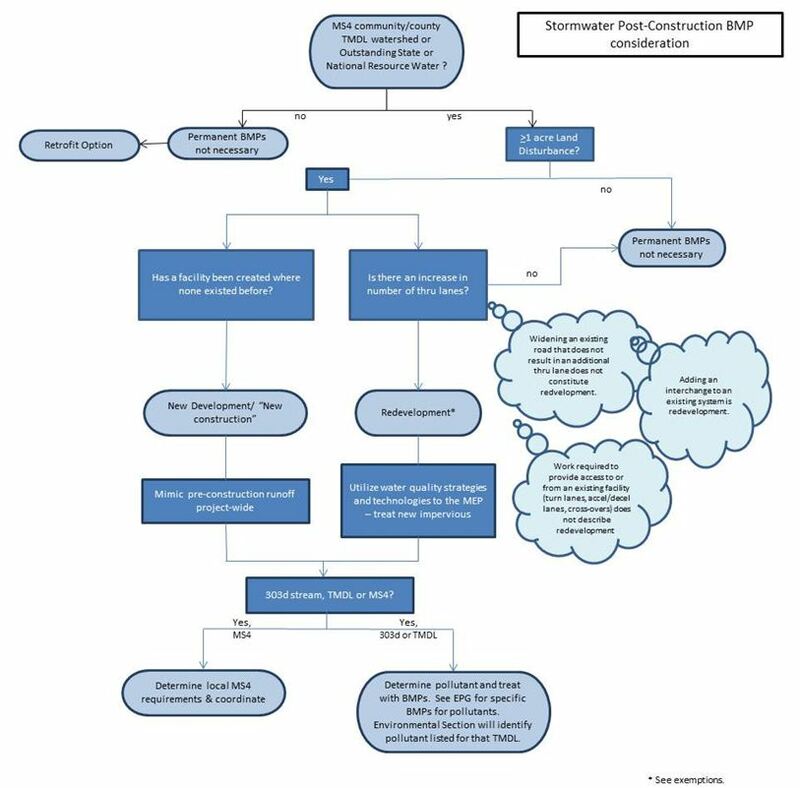 For cost-share projects within the MS4 area, permanent BMPs shall be applied using the flow chart to areas on MoDOT right of way that is applicable. If it is not feasible and there are opportunities within the adjacent MS4 community, a swap is acceptable. An agreement for long-term maintenance must be agreed to by both entities. If funding is through the community or county and MoDOT is only providing engineering services, post-construction BMPs are not required to be considered by MoDOT but may be required by the community or county under their stormwater permit. Cost-Share projects that are entirely specific to a design element, such as railroad grade separations, sidewalks, etc. may be exempt if no other work is involved in that MS4 project area. If a project is a result of an adjacent development and would not have otherwise been constructed by MoDOT, the water quality and/or quantity features shall be included in that development. If adjacent developments require an access permit and are within the MS4 coverage area, runoff from adjacent development must be treated prior to entering MoDOT right of way or directed away from MoDOT right of way. Adjacent development that drains to MoDOT right of way cannot increase flows from the pre-construction condition. Bridge washing and cleaning activities. 5. Controls for reducing or eliminating the discharge of pollutants from highways and MoDOT owned and operated parking lots, maintenance and storage yards, waste transfer stations, fleet or maintenance shops with outdoor storage areas, and salt/sand storage locations and snow disposal areas at MoDOT building and lots. Facility Runoff Control Plans (FRCP) are required at all MoDOT maintenance and operations areas referenced above. EPA guidance on minimum control measures, National Menu of Stormwater BMPs. EPA SWMM model for stormwater BMPs. AASHTO, 2014, AASHTO Drainage Manual, 1st Edition, American Association of State Highway and Transportation Officials. A public hearing may be requested during the public notice period for MoDOT’s TS4 Site-specific State Operating Permit. The public notice will be posted on MoDOT’s stormwater page and emailed to media statewide when MoDOT is submitting a renewal application to the MDNR, typically every five years. The request must give reasonable cause for holding the hearing. A public hearing will be held if there is significant technical merit and concern related to the responsibilities of MoDOT. At least 30 days prior to the hearing MoDOT will post public notice of the hearing. The hearing will be held in the geographic area appropriate to the request. This page was last modified on 25 July 2018, at 07:13.